Japanese Episode DP 025: "The Extraordinary Roserade and the Flower Legend!" American Episode 489: "Oh Do You Know the Poffin Plan!" Satoshi and his friends have arrived in Sono'o Town! As Hikari gets excited about her chance to win a Contest Ribbon, she spots an advertisement for a Poffin cooking class. After explaining to Satoshi and Takeshi what Poffins are, the trio agrees to participate in the class. As the instructor, Tsubomi, helps each trainer figure out the best way to make the pokemon snacks, our heroes notice a shy Roserade at the school. Tsubomi reveals that she met the pokemon when it was still a Subomi and watched it evolve all the way into a Roserade. The pokemon helped Tsubomi plant all the flowers in the garden and made it the natural wonder it is today. As soon as Tsubomi finishes her story, the Rocket-Dan appear to steal all of the berries that Roserade helped plant! As our heroes fight off the Rocket trio, Roserade sneaks into Tsubomi's house and wraps a scarf around its head. The scarf, given to it by Tsubomi when they first met, gives Roserade the confidence needed to join the battle. The Rocket-Dan notice this and steal the scarf, thinking this will render the pokemon helpless. However, Tsubomi cheers from the sidelines are heard by Roserade and give it the courage to continue battling. The Rocket-Dan are defeated and the berries are returned to Tsubomi's garden and, after a Sunny Day attack, begin to grow again. Later, Hikari perfects a recipe for her Poffin, giving her another tool to use in her quest to become a Top Coordinator. So we arrive in Sono'o Town...and luckily, the anime actually pays attention to the city the game created and incorporated its uniqueness into the anime. Remember how bland and boring Hiwamaki City was in the anime even though it was one of the most unique cities in all of Ruby & Sapphire? It looks like the anime people have learned their lesson. This episode also presents us with a rare moment of the writers actually having a memory. I was thrilled when Satoshi made a reference to the Polocks in Houen until I remember that he still hasn't bothered to mention his old traveling companion from that region. Y'know, the other Coordinator who explained what Polocks were in the first place? We're 25 episodes into the series, guys...surely it wouldn't kill you to have at least one mention of Haruka. The episode had a lot of other things to like, though. The different art style used during the retelling of Sono'o's legend was refreshing and unexpected. I also like how Hikari's actually using the Poketch she worked so hard to get a few episodes back, unlike a certain bespectacled little brother who shall remain nameless. I also liked how Hasuboh isn't just a random background pokemon and actually does things. The sort-of kind-of Schindler's List homage is bizarre (the (almost) black and white film with a bright red scarf and all), but it's a solid episode all around. The dubbed version scraped "Forsythia" out of their barrel of unused English names. It makes sense with the flower pun and all, but...it's just a weird name. Tsubomi isn't that great a name either (though the fact that it sounds very close to Budew's Japanese name can't be a coincidence), but at least it's not as hard to spell. 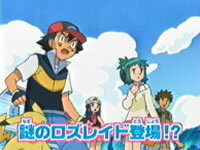 In the Japanese version, the ending theme is changed to a "POP UP" remix of the song By Your Side ~Hikari's Theme~. The remix is...well, it's not my favorite song ever, but it'll do. The TO BE CONTINUED... screen is three seconds longer in the dub than it is in Japan.